Home >> Lesson Plans >> A World of Learning: Celebrate Books: A (Book) Week of Fun! The calendar might identify mid-May as Children's Book Week, but for most teachers -- always on the lookout for new ideas to promote literacy -- every week is Book Week. For those teachers and their students, Education World offers the following additions to its extensive library of lessons emphasizing reading skills and enjoyment across the grades. Included: Five new lesson plans for reading fun. The Web is full of great resources for making reading fun. If you aren't sure where to start, one terrific resource is the Database of Award-Winning Children's Literature. Whether you're teaching about a culture, a country, or an historic period, or simply are looking for great books for students of a certain age, you can search this database of children's books by one of those categories. You also can search the database by key word; try typing in the curriculum themes you currently are teaching. See what reading tie-ins you can make! Find lesson plans, great projects, and additional Book Week resources. Dozens of Education World articles offer unique lessons and ideas for teachers of reading at all levels. 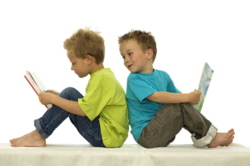 FIVE NEW LESSONS FOR READING FUN! As you begin your Book Week activities -- or your any-week book activities -- be sure to check out our new book report and book review templates. These printable, editable templates -- which can be customized as necessary to meet your needs -- can be printed and completed by hand or students can complete them on a computer using any word processing program.